Erokan, Coleman and friends smile upon the format with inventive work in "Jetpack Go!" 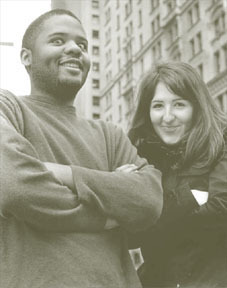 D’Arcy Erokan and Devon Coleman, who previously presented the live talk show “Cocktail Hour” at the People’s Improv Theater (reviewed 11/20/06), have returned with a new sketch group, Frowned Upon, with a new show, “Jetpack Go!” at the PIT on Friday nights in September. The show, written by Coleman and featuring Erokan with Jason Garden, John Murray and Tracy Weller as performers, excels at playing intellectual references into silly or dumb contexts just as Monty Python did so well in the 1970s. A simple sketch where Garden is trying to convince Murray not to tell his girlfriend that he’s out with another woman, first adds a layer where Garden addresses Murray repeatedly with variations on the word “bro,” culminating by calling Murray “Ivan Broesky” -- then giving a long dry explanation of who Ivan Boesky was when Murray doesn’t know. It’s a well-placed diversion. Erokan also has fun with another sketch in which she and Garden play Dracula’s parents as Jewish kvetchers. To describe this in too much detail would spoil it, but Erokan does self-referentially play with the delivery of the dialogue. And once again, just as they did in a live talk show format with “Cocktail Hour,” Coleman and Erokan are breaking new ground and being inventive, this time in the sketch format. They do all of this without costumes, as do the rest of the cast, particularly Murray playing a Jim Carrey/Ace Ventura-obsessed fan who awakes from a coma after 10 years and cares only about finding out more about the Ace Ventura sequel, even though his wife is there telling him she’s remarried. Weller and Garden, as they hint during the show, come more from a regular acting background, than sketch or improv comedy training, and they are allowed to put that into service with actor-ly dramatic moments here and there, but that’s quickly brought to earth and punctured with humor. The acting is done well enough that it fits that purpose for the show -- especially in one scene where Weller plays a woman confessing that her dad molested her -- so spilling this secret can be quickly punctured with a dark joke. Erokan and Coleman and their colleagues are doing interesting sketch comedy work in “Jetpack Go!” that is worth catching and that also makes it worth looking forward to what comedy sub-genre they might take on next.